Breakfast Burritos are a hearty, satisfying, make ahead and freezer friendly breakfast! Breakfast Burritos can be enjoyed fresh and hot or saved in the freezer for an easy make-ahead breakfast. 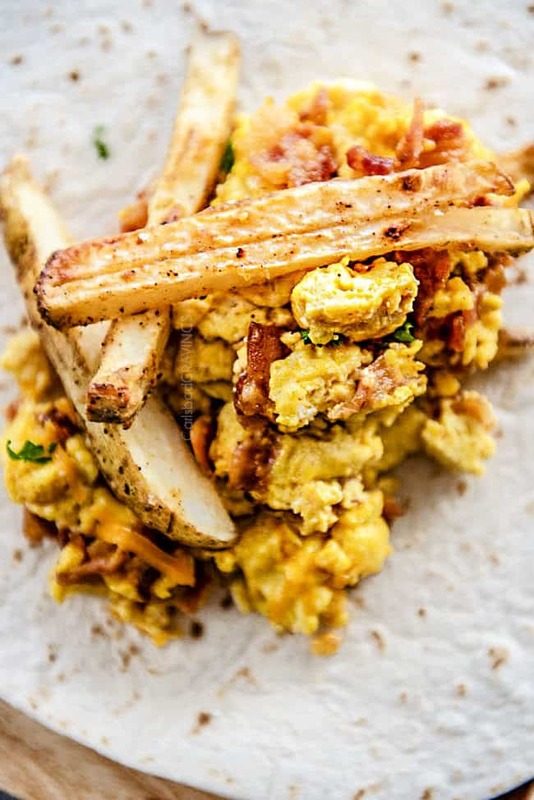 You can make these Breakfast Burritos California Style with French Fries, bacon and cheesy scrambled eggs, or I’ve included all sorts of ways to customize your burritos from roasted potatoes, hash browns or tater tots, to sausage or ham. But anyway you serve them, I promise they will be bursting with loads of flavor, a delightful crispy toasted exterior and ooey gooey cheesy center and the BEST Creamy Salsa Sauce! Burritos have to be one of the most comforting food on the planet. From Wet Burritos to Chicken Burritos to Bean ad Cheese Burritos to California Burritos – they have my heart – and my belly. But how often do you have burritos for breakfast?! Breakfast Burritos are pure genius in my opinion. They not only start your day off deliciously but fuel you trumphantly for the rest of the day. My favorite type of Breakfast Burrito is a California Breakfast Burrito endeared to me by my surfer husband. I probably added more words to my vocabulary the first month of meeting Patrick than I had in the last 10 years (you can read our Love Story here). Words like “snap,” “cut back,” “sweet air,” “double over head,” “round house cutback,” “drop in,” “grab rail,” “off shore wind,” “floater”…and much more surf lingo. Every Saturday without fail, Patrick hits a “morning surf sesh” followed by a California Breakfast Burrito from a different local taco shop. So a while back, I told Patrick to forgo his taco shop ritual and I would not only have 1 breakfast burrito waiting for him after his surf sesh, but 6 homemade breakfast burritos waiting for him. So what makes a California breakfast burrito different from any other breakfast burrito? More delicious than any other breakfast burrito? French Fries. Garlic, cumin, cayenne, crispy French fries. These Breakfast Burritos will fill you with so much surfer Southern California goodness, you might even have the urge to try your hand at a double round house cutback next time you visit, because these California Breakfast Burritos, my friends, are “legit!” ….but if you are feeling like a more low key beach walker, then, never fear, I have all sorts of customizable options for you too! What do you put in a breakfast burrito? While I favor California Breakfast Burritos, Breakfast Burritos come in all varieties. 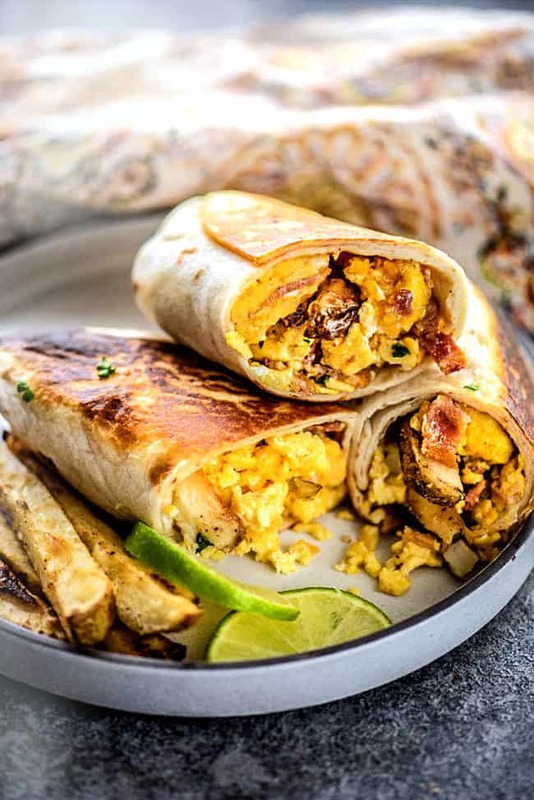 Almost all Breakfast Burritos contain scrambled eggs and then either meat (bacon, sausage, chorizo or ham), potatoes (roasted potatoes, hash browns, tater tots or French Fries) and cheese (cheddar, Pepper Jack, Monterrey, Cotija). Breakfast burritos can also contain vegetables (onions, bell peppers, spinach). I’ve included instructions below on how to make many of these different elements so you can mix and match to create YOUR favorite Breakfast Burrito! Cut the potatoes into thin fries and toss with French fry ingredients in a large bowl until evenly coated. Spread potatoes evenly over prepared foil and bake for 20-25 minutes, or until tender, then broil fries until golden and crispy. Cube 2 pounds red potatoes into bite size pieces. Add potatoes to baking sheet and toss with 2 tablespoons olive oil (instead of 1 T for Fries) and remaining French Fry seasonings. Spread potatoes in an even layer and bake for 25-35 minutes, or until fork tender and golden in some places, stirring half way through. (If you like your potatoes crispy, bake for longer). Cook 3 cups frozen hash browns according to package directions, sprinkling with “Fry seasoning “before cooking. Toss a 20 oz. bag frozen tater tots with “French Fry” spices before cooking. You can use less tater tots in the Breakfast Burritos if you wish. While the potatoes are roasting, make bacon working in 2 batches. 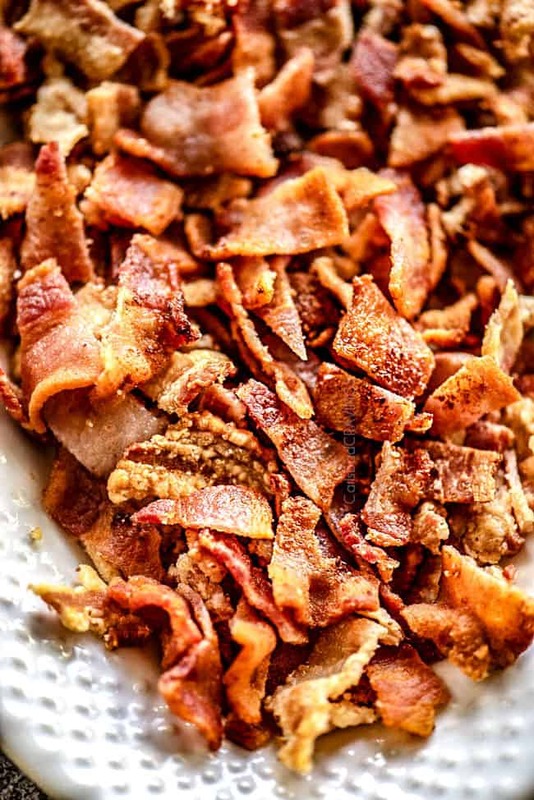 Lay bacon strips on a COLD pan – it is okay if the bacon is touching – it will shrink as it cooks. Cook bacon low and slow. When the bacon starts to curl, loosen it with tongs and flip. Continue to flip periodically so it browns evenly. Cook bacon until crsipy, keeping in mind it will cook a little off heat. Using tongs, transfer bacon to a paper towel lined plate. Repeat with second batch of bacon. Add 1 pound breakfast sausage to the pan. Cook and crumble until its cooked through and no pink remains. You can also use both sausage and bacon in your Breakfast Burritos. T do this, I would use a 10 oz. roll of breakfast sausage and 8 strips bacon. In the same bowl you mixed your fries (no double pans! there will be some fry spice left), whisk together eggs, onions, bell peppers, green chiles, milk, salt, chili powder, pepper, and hot sauce. Add eggs to the now empty bacon skillet and cook over medium-low heat. When eggs are almost set, stir in cheese and bacon and finish cooking eggs, 30 seconds or so – don’t overcook! I’ve included green chiles, onions and bell peppers in my scrambled eggs but you can omit any of these or add any veggies your heart desires. Assemble burritos by spreading a thin layer of sour cream down the middle. The sour cream is optional but I LOVE the tangy creaminess it adds. Top sour cream with eggs and then the French fries. For extra cheesiness, top with extra shredded cheese – this is always a good idea. Roll tortillas up burrito style by folding in the sides then rolling up tightly. 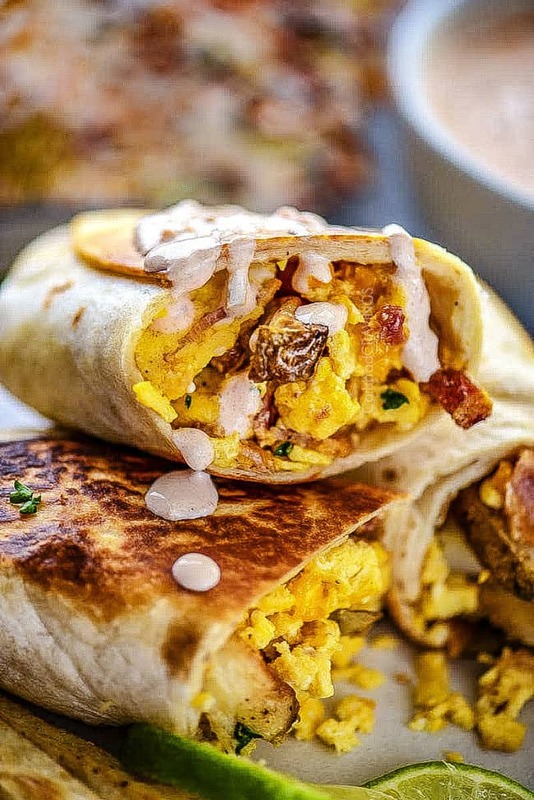 How do I make Crunchy Breakfast Burritos? Instead of baking the Breakfast burritos, searing the gives them a more tantalizing crunch. Heat 1/2 tablespoon oil in a non-stick skillet over medium heat. I use the same pan I’ve been using so I only dirty one skillet. Place half of the burritos seam side down in the skillet. Cook until golden brown, approximately 1-2 minutes, and then flip and cook other side until golden brown. To make the Breakfast Burrito Sauce, simply mix all of the ingredients together and chill in the refrigerator. HOW LONG CAN YOU KEEP A BREAKFAST BURRITO? These Breakfast Burritos will keep in the refrigerator for up to 5 days and in the freezer for up to 3 months. If freezing, make sure to label so you know when they need to be eaten by. You can make Breakfast Burritos ahead of time then store them in the refrigerator for up to 5 days for a grab and go breakfast! Assemble: Assemble burritos by spreading some shredded cheese down the center of each tortilla (not in original recipe) followed by the sour cream, eggs and French fries on each tortilla. The extra cheese buffers the sour cream and egg moisture and keeps the tortilla from becoming soggy. You can omit the sour cream but I still suggest some extra cheese. 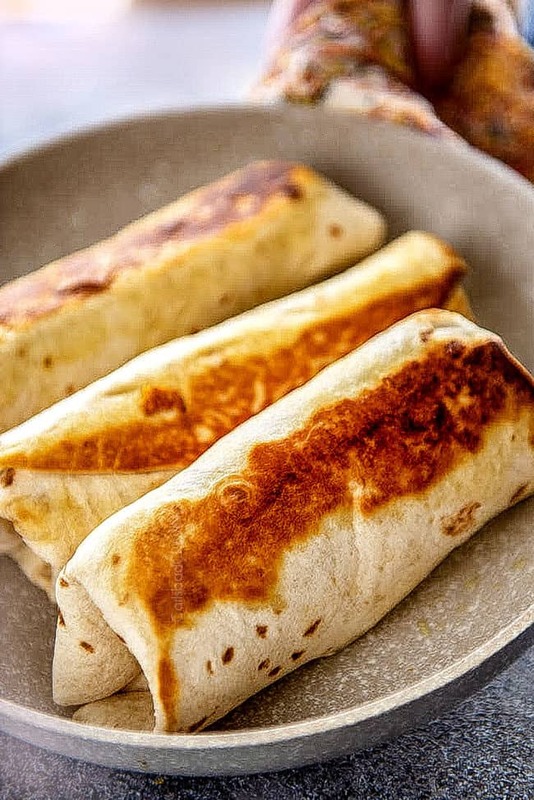 Roll: Roll tortillas up burrito style by folding the sides over the filling, then tightly rolling from the bottom up. Toast: You can either toast the Breakfast Burritos now if you are going to eat these Breakfast Burritos on the go and won’t have time to toast later OR you can skip the toasting step if you are going to toast later. Toasting later will make for crispier tortillas. Wrap: Wrap individual burritos up tightly in foil. Store: Store wrapped burritos in the refrigerator for up to 5 days. Eat: Remove Breakfast Burrito from foil and place on a microwave safe plate. Microwave on high for 1 to 2 minutes, until warmed through, or heat in an oven at 350°F for 8 to 12 minutes. Toast in a skillet per recipe instructions for extra crunch. Assemble: Assemble burritos by layering some cheese (not in original recipe) followed by the sour cream, eggs and French fries on each tortilla. The extra cheese buffers the sour cream and egg moisture and keeps the tortilla from becoming soggy. You can omit the sour cream but I still suggest some extra cheese. Wrap: Skip toasting step and wrap individual burritos up tightly in foil. Freeze: Freeze burritos in a single layer on a baking sheet. This will help them freeze faster and not get squished. Store: Add frozen burritos to a large freezer size bag, remove excess air and seal. Serve: Remove frozen burrito from foil and place on a microwave safe plate. Microwave on high for 4 to 6 minutes, flipping halfway, until warmed through OR heat in the oven at 400°F for 25 to 35 minutes or until warmed through. Toast in a skillet per recipe instructions for extra crunch. 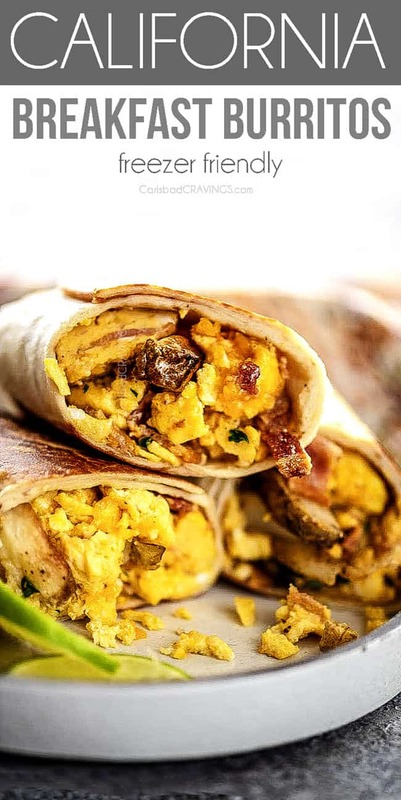 Want to try this Breakfast Burrito RECIPE? Pin it to your Mexican, or Breakfast Board to SAVE for later! California Breakfast Burritos are the best breakfast burritos you will ever have. period! They are loaded with crispy Mexican spiced french fries, cheesy bacon-eggs, rolled in a tortilla and toasted then smothered in Creamy Salsa. That's what makes a CALIFORNIA Breakfast Burrito. And it is irresistible. 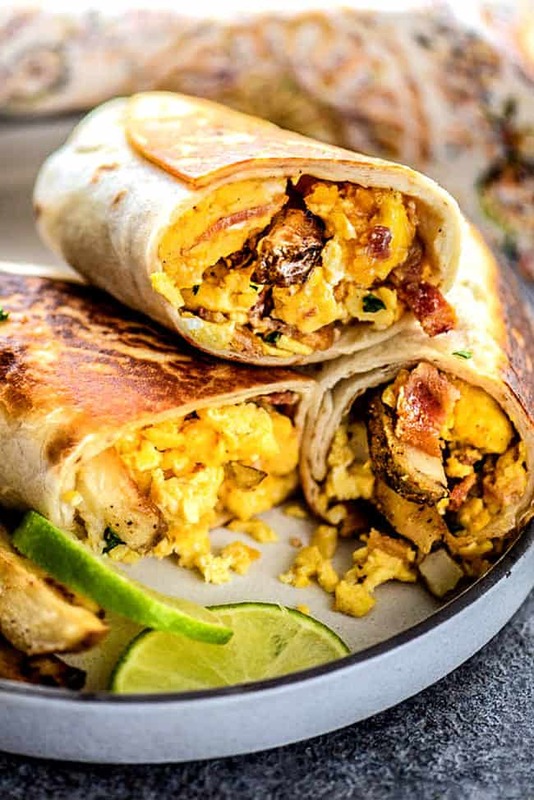 You can also customize your Breakfast Burritos and swap out the French Fries for roasted potatoes, tater tots or hash browns and sub the bacon for sausage. I've also included Make Ahead and Freezer Breakfast Burrito Instructions. Preheat oven to 400 degrees and line a baking sheet with aluminum foil; spray with non-stick cooking spray. Cut the potatoes into thin fries and toss with French fry ingredients in a large bowl until evenly coated. 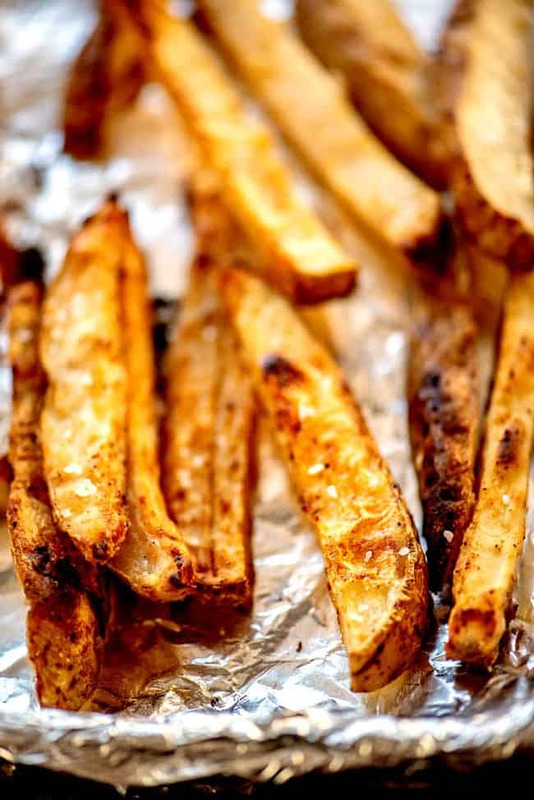 Spread potatoes evenly over prepared foil and bake for 20-25 minutes, or until tender, then broil fries until golden and crispy. Meanwhile, (working in 2 batches), lay bacon in a cool, large non-stick skillet. Heat over medium-low heat and cook, flipping occasionally until very crispy. Transfer to a plate lined with paper towels. Chop into bite-sized pieces when cooled. Drain all but 1 tablespoon grease from pan. 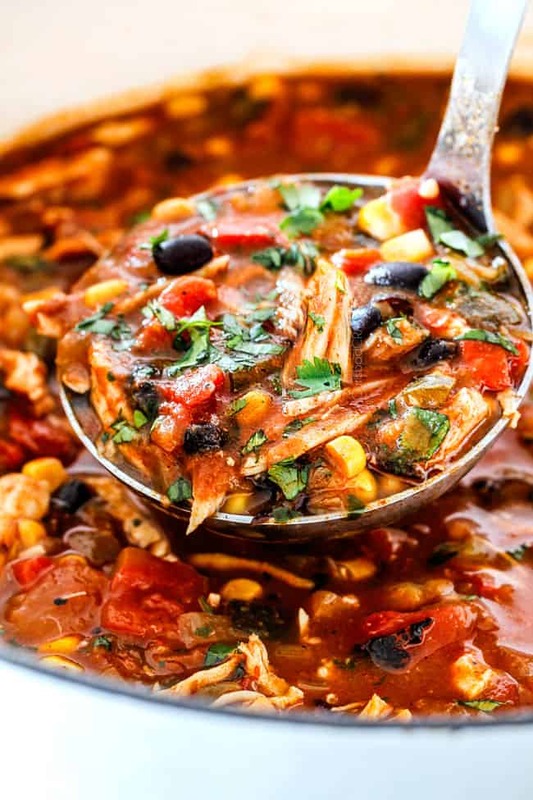 Prepare salsa by mixing all of the salsa ingredients together. Store in the fridge. In the same bowl you mixed your fries (there will be some fry spice left), whisk together eggs, onions, bell peppers, green chiles, milk, salt, chili powder, pepper, and hot sauce. 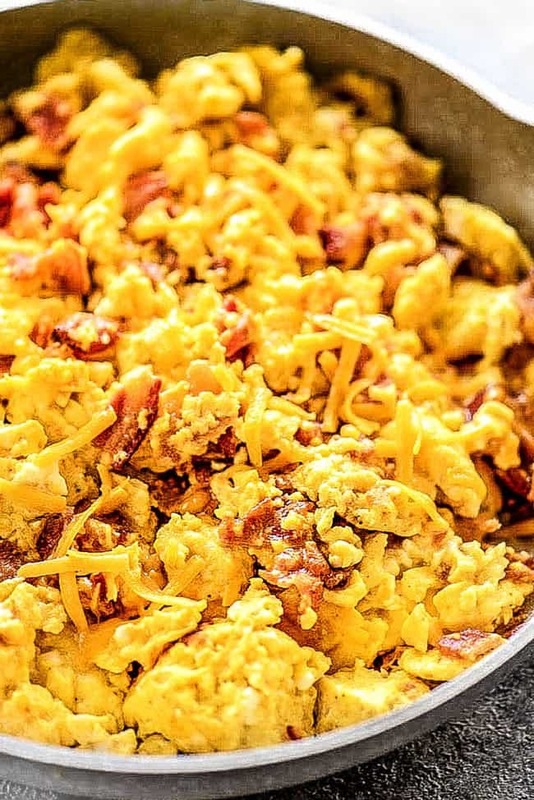 Add eggs to the now empty bacon skillet and cook over medium-low heat. When eggs are almost set, stir in cheese, tomatoes, cilantro and bacon and finish cooking eggs, 30 seconds or so - don’t overcook! Assemble burritos by spreading some sour cream down the center of the tortilla then topping with eggs and French fries. For cheesier burritos (I HIGHLY recommend) top with desired amount of extra cheese. Roll tortillas up burrito style. To sear the burritos for a golden crunch: Heat 1/2 tablespoon oil in a non-stick skillet over medium heat and place half of the burritos seam side down in the skillet. Cook until golden brown, approximately 1-2 minutes, and then flip and cook other side until golden brown. Repeat with remaining burritos. 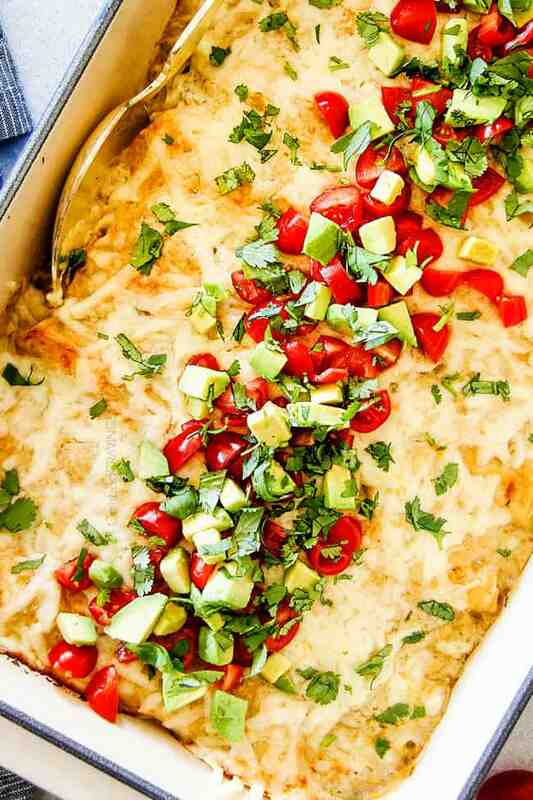 Serve with creamy salsa OR salsa, sour cream, avocados/guacamole, pico de gallo and/or chopped tomatoes. Cook 3 cups frozen hash browns according to package directions, sprinkling with "Fry seasoning" before cooking. Toss a 20 oz. bag frozen tater tots with "French Fry" spices before cooking. You can use less tater tots in the burritos if you wish. Toast: You can either toast the Breakfast Burritos now if you are going to eat these Breakfast Burritos on the go and won't have time to toast later OR you can skip the toasting step if you are going to toast later. Toasting later will make for crispier tortillas. Eat: Remove frozen burrito from foil and place on a microwave safe plate. Microwave on high for 4 to 6 minutes, flipping halfway, until warmed through OR heat in the oven at 400°F for 25 to 35 minutes or until warmed through. Toast in a skillet per recipe instructions for extra crunch. I LOVE breakfast burritos! I could eat them every day. I could eat Mexican food every day. Must be the SoCal in my blood! And, these burritos look fabulous! I also LOVE that you can freeze them. Thanks so much for sharing these yummies! You sound just like me Debi! Mexican everyday would be a wonderful thing! Thanks for stopping by! 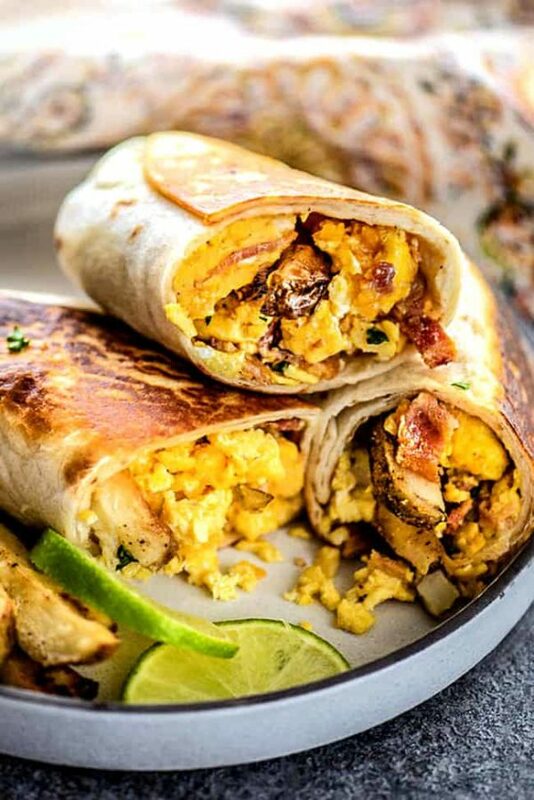 I’ve never had a breakfast burrito, but I could easily fall in love with a couple of these. They look absolutely delicious! Thanks Taylor! I hope you try them soon! Everything with French Fries has to be good, right? Oh how I love breakfast burritos! Thank you for sharing. You are most welcome Korilynn! This looks so yummy!!! I will have to give it a try. Please do! They make a great dinner too! Wonderful pictures! Great feature also, pinned! Looks fantastic! Love anything breakfast and anything with avocado! Yummy! Taco bell and McDonald’s have nothing on your California Breakfast Burrito 😉 Thanks for the recipe. My husband had been craving a really good Carlsbad California breakfast burrito, and after a disappointing attempt to find a close match here in Utah I made these this week. I added steak as well to it. It was so good. Hit the spot. He hasn’t stopped talking about it. We love the potatoes with the cumin and cayenne. Thanks Jen. Several years ago I worked on Faraday Ave in Carlsbad and we used to have Breakfast Burritos for breakfast from a cafe (I think on Rutherford but not sure). These Burritos were to die for and had a very dominant garlic infusion! I have dreams about them still after all these years. Are you familiar with them or do you have comparable recipes with a heavy duty garlic element? I will definitely give your recipes a try. Hi Paul, what a small world! I am not familiar with the cafe/burritos on Faraday but they must be heavenly if you are still dreaming about them! I love the sound of “garlic infusion” – mmmm! If you want a stronger garlic taste, I would add 3-4 cloves minced garlic to the egg mixture so the garlic is cooked directly with the eggs AND/or you could add more garlic powder to the French Fries. Let me know how it goes! Jen these were awesome!! I’m not sure why I never thought to put cornstarch on the fries- brilliant! Jesse’s always wanting breakfast burritos on his days off so I love that I can make great ones from home now. Thanks! This is an oldie recipe but a goodie! I’m so glad you both loved it too and that is awesome you can now make them for Jesse at home! Thanks Layne!